One thing I love about traveling is shopping for vintage and handmade goods, especially from cities with eclectic personalities such as Austin. After spending a day in Dallas Debra and I took off for Austin and headed straight to South Congress. Although a condensed street, the wide array of shops, restaurants and thrift stores made this street very time spendable. It reminded me a bit of Haight Street in San Francisco, except of course with a Texas flare. We wandered into Feathers Boutique and both our eyes immediately drew to these black fringe boots staring at us from the window. I often consider myself unlucky for having abnormally small feet except for those instances where I’m shopping and all that’s left is a size 5.5-6 which happens to be my size. 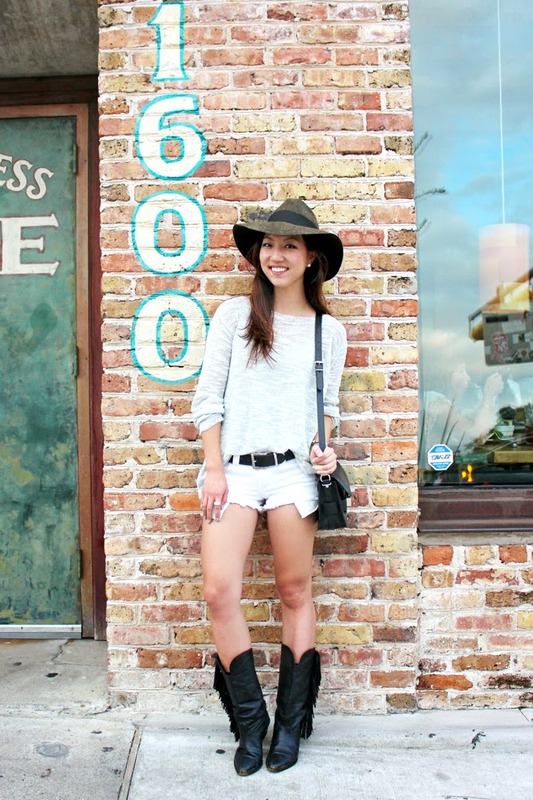 These one of a kind size 6 boots were the perfect compliment for my petite feet and I immediately threw them on after purchasing so they could explore Austin, TrendEnvy style. Gorgeous! I really love that top. It looks comfy but chic. Cool look, loving your smile today! love ur boots seriously so chic. xO!